We have used cloth napkins for over a year now. The kids were down right shocked when I bought a package of paper napkins a couple of weeks ago. It hasn’t been good weather lately for drying clothes, and since we don’t use the dryer, this can lead to a laundry back-up. So I bought paper to have just in case we run out of cloth. 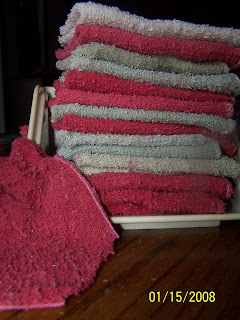 But what to do when the washcloth starts looking a little worse for wear? It gets demoted to a cleaning cloth. But how do you keep those cleaning clothes from ending up in the napkin holder? I now cut off one of the corners on the “new” cleaning rag. Now if someone else should fold and put away the laundry (???????) it’s clear which cloth is a napkin and which one is a rag. I love this! One tip I would add is to hem stitch the part you cut so the rag doesn’t start to fall apart. Now that my 4 kiddos are out of diapers (except the littlest one at night only), I have gobs of the old cloth diapers that I can use for cleaning rags. Here from Rocks in My Dryer. I like this idea a lot! We have made homemade cloth napkins that just didn’t work very well. Now you’ve convinced me to use the washcloths. I guess I could just save the “fancy” cloth napkins for company. Thanks for the tip!